Thailand’s Ministry of Agriculture and Cooperatives, working with the Ministry of Natural Resources and Environment, plan shift from conventional to low-emission rice farming to reduce greenhouse gas emissions by more than 26 per cent over the 5-year span of a project to be funded by the multi-donor Nationally Appropriate Mitigation Actions (NAMA) facility. The shift will involve 100,000 Thai rice farmers and will drive wide-scale adoption of the rice standard of the Sustainable Rice Platform that offers a practical framework for promoting climate-smart best practices and improving the livelihoods of Thailand’s rice smallholders. Thailand is among the top 15 countries worldwide most affected by climate-related impacts. With the ratification of the Paris Agreement in September 2016, the Royal Thai Government committed to contribute to global efforts to achieve climate change mitigation. Agriculture is Thailand’s second largest emitter of greenhouse gases and one of the most vulnerable sectors to adverse climate change impacts. 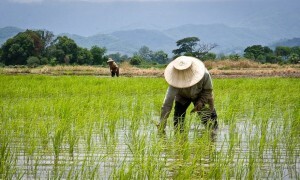 The country’s rice sector ranks as the world’s fourth largest emitter of rice-related greenhouse gases, mainly methane. “Thailand’s Rice Department , under the Ministry of Agriculture and Cooperatives, which is a member of the National Committee on Climate Change, is the main implementing agency for the sustainable development of the rice sector. The Rice Department will participate in and support the implementation of Thai Rice NAMA,” said Mr.Anan Suwannarat, Rice Department Director-General. “The project will work with farmers and farmers’ associations in six provinces in the Central Plains of Thailand in shifting from conventional to low-emission rice farming, and promote its replication on a national scale and in the ASEAN region. The switch to low-emission cultivation of rice is estimated to help reduce baseline emissions from irrigated rice by more than 26 per cent over the 5-year lifespan of the project, with increasing annual mitigation potential,” said Dr. Matthias Bickel, GIZProject Director. “Rice is an important crop to millions of small farmers in the Asia and Pacific region and an important contributor to food security, livelihoods and income of rural populations. This project will not only help boost production of this critical staple, but also protect the environment, safeguard livelihoods and mitigate climate change impacts. We look forward to working closely with the Thai Government and partners on this important initiative,” said Dechen Tsering, Regional Director, UN Environment Asia and the Pacific Office. Co-convened by UN Environment and the International Rice Research Institute, the Sustainable Rice Platform is a global multi-stakeholder alliance that promotes resource-use efficiency and sustainability in the global rice sector. SRP and its 70 institutional partners aim to encourage one million farmers to adopt climate-smart sustainable best practices by 2021, as an active contribution to the UN Sustainable Development Goals.